Measured by the present standard The affluent society by J.K. Galbraith is not an excellent book. It pleads for a reinforcement of the public sector, but there are other books, that do this better and with more conviction. 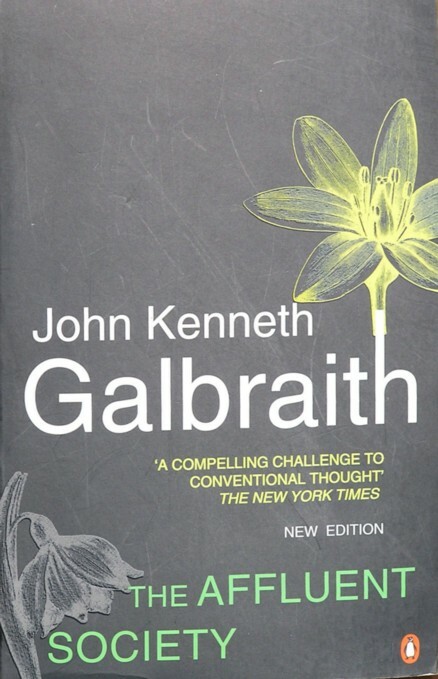 Moreover Galbraith can be reproached with the exhibition of a rather conservative and narrow-minded morale in several chapters. Nevertheless the affluent society is exceptional, since Galbraith is the first to stress the significance of the public weal. Thus the book, which appeared for the first time in 1958, has become the source of inspiration fot other authors, who may be more well-grounded in politics and society than Galbraith. So The affluent society deserves a review because of its pioneering effect. After the Second World War the theory of Keynes had convinced everybody, that the state and the government must play an active role in the consolidation of the investments. Galbraith furnishes in The affluent society the arguments, that prove the necessity of investments in several areas of policy. Evidently his work met with a wide response especially in progressive movements, such as the social democracy. In the Netherlands the book was the direct cause for the publication of the report Om de kwaliteit van het bestaan by the Wiardi Beckman Foundation, in 19631. At the time it provoked Drees Jr., by no means the best man you see, but raised during the austerity of the period of reconstruction, to tease Den Uyl with the nickname "professor Uylbraith"2. Galbraith belongs to the institutionalists. He believes that the circumstances are more defining for the economic developments than the abstract universal rules of thumb. To put it differently, the so-called general wisdom adapts itself to the prevailing spirit of the time. They lead to an informal doctrine, that aims to reduce the uncertainties. In the economy. since the Second World War liberalism is replaced by the policy of the welfare state. Thanks to the Keynesianism the endeavour to balance the budget is abandonned. Galbraith describes in a bird's-eye view the ideas behind the classical and neoclassical theory. Both these paradigmas profess that a moderate wage level is desirable. The accumulation is needed in order to be able to invest. He pays much attention to Karl Marx, who in imitation of De Sismondi claims more purchasing power for the workers. According to Galbraith the main merit of Marx is the integration of the sociology, the economy, the politics, and the study of the causes of war. The Great Depression of 1929 and beyond has proven that Marx is right. The income distribution is skew, so that the group with an income below modal is a majority. Yet the increasing inequality does not appear to excite a large-scale opposition. In the beginning many capitalists revelled in a conspicuous wealth. Their excesses have been registered in a striking way by the economist Thorstein Veblen. Later the power and the status of the capital-owners have faded. The management of the enterprises is taken over by the so-called technostructure. Thanks to the continuous economic growth the welfare of the workers can be increased, without redistributing the existing wealth. Growth is now seen as the most important means against existential uncertainty and inequality. The enterprises do not primarily strive for the maximalisation of profit, but for the reduction of riscs. They form cartels and strive for a monopoly position. In the crisis years it was realized, that in an ever more compex economic system there is a need for control mechanisms in the micro- and macro-economy. The people have something to lose. In spite of the social security the productivity rises after 1929. The benefits become a part of the built-in stabilizers. The economic growth is realized mainly by means of a better organization and a more effective use of the resources. In other words, the emphasis is on intensive growth. The propensity to consume diminishes. Now many products have to be disposed by means of advertising and persuasion. The budgets for advertisements take on an enormous size. The costumers are even spurred to buy on credit, especially in the automobile branch3. Galbraith thinks, that the people will benefit more from public services in stead of material goods. Nevertheless the growth of the public sector remains behind the industrial growth. One is prepared to pay for a clean house, but not for a clean neighbourhood. It is an argument that incites melancholy. Are you still there? The failure of enterprises is not a severe blow to the consumers. However the dismissed workers lose their income. A recession in the demand threatens the economic stability. The abundance is so overwhelming, that the consumers will finally no longer crave for the products. Of course the propensity to consume also decreases in times of recession. Since the Second World War the fear of inflation has subsided. If she occurs, then in general the state fights her with a monetary policy. Often the entrepreneurs are capable to pass on the rising wages in the product prices. The inflation is mainly harmful for groups, that can not influence their own income. The monetary policy should be protected against the democratic decision-making. The aim is to discourage the demand. However a change in the interest rate has little effect on the credits to consumers and enterprises. Moreover the large corporations have access to alternative sources of capital. The levying of taxes has a more direct effect on the economy than the monetary policy. During a period of prosperity the taxes should be raised. Of course this political measure is not popular with the people. Now Galbraith reminds the politicians, that taxes are necessary in order to pay for the state activities. The prosperity in the production of goods is a heavy burden on the collective sector, and causes a crisis there. The social balance, the proportions of the private and collective sectors, gets disturbed. The education, the police, the public space, the sanitary department, the health care, and the public transport fall into decay. An increasing sale of cars places additional demands on the parking capacity, the police, and the infrastructure of roads. Good house construction requires a reliable infrastructure. It is surprising that Galbraith qualifies this need for a balance as merely a theory, which somewhat disparages his argument. For it is a reality. The primacy of the private sector affects the quality of training. The individual entrepreneur is averse to training, for it costs money. There is even insufficient investment in research, although it is crucial for innovation. Only the defence (the military-industrial complex) is an exception. Collective services are indispensable for the cohesion of the society. They reduce the social tensions, and augment the general well-being and happiness. Here Galbraith takes the view, that some low-skilled people can never be integrated into the workforce. There are galoots galore. He wants to keep them away from the labour market. They should obtain fair benefits, for instance a negative income tax. Thus they form a labour reserve, that stabilizes the wage level. Of course the full employment could be furthered by means of a demand stimulation, but according to Galbraith this is too expensive. In this respect the avarice of Galbraith is almost galling. Galbraith attaches little value to an equal income distribution. Therefore he favours a non-progressive income tax. He recommends a raise of the VAT. In his opinion this is less troublesome than a rise of the income tax and the capital gains tax, which will meet with a strong opposition. Apparently Galbraith does not appreciate the progressive income tax as an automatic stabilizer of the economy. The priorities of Galbraith are the yield of taxes in general, and the maintainance of the social balance. In our days the poor people live in such conditions, that they become demoralized. Galbraith wants to improve their situation. But most of all he wants more investments in education and health care. The labour market should allow for more leisure time, or for a lower productivity. Even now work is for many people a pleasure in stead of an indispensable income. Galbraith calls this the new class. They are not an elite, on the contrary, their numbers grow fast. Thus Galbraith ends his gale of criticism with a promising perspective.